When I first mentioned doing this article and having it every week on game eve, I was truly worried whether or not I would have enough material. The truth is, there’s plenty from around the sporting world to fill the good, the bad, and the ugly up to the rim. Let’s get started with the first easy part. Everybody is talking about Jordan Hall’s game and in our first effort to get the fan’s involved with tBBC Fans Interact:Buffalo he was the Unanimous choice for #BufOMVP 11-1 over QB Braxton Miller. His first long TD run was ton’s of fans favorites as well for #BufTopPlay. Hall was rumblin to the tune of 21 carries for 159 yards and two TD’s. What I am surprised nobody is mentioning, unless I have missed it this past week, is what that performance really means to the career of Jordan Hall at Ohio State. In one game, and bear in mind he has been snake bit the entire time he has been here, he almost topped his totals in three of his other seasons. Look closely and you will see that in one fell swoop he set his new career longest run from scrimmage(49); scored as many TD’s(2) as he had in any previous season total, and set the tone for how valuable he will be this season catching the football(3/14 in tough spots). Granted, he will need alot more carries to surpass 99 in a season, which he will do regardless of Hydes return. He will also keep the YPC average up high, he’s proven to gain well on each carry. I for one am very pleased with his first game performance considering he also had one of the best LB’s in the college game tracking him down every play. Jordan Hall will have one of those kinds of seasons that only come around every once in a while in Columbus and he may very well be the one to give Coach Meyer his first 1,000 yard rusher that’s not a QB. 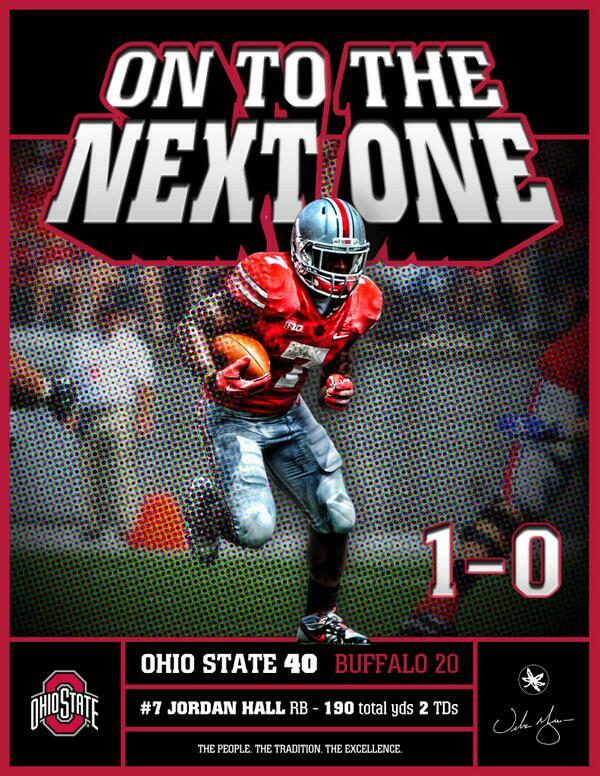 Heading into the first game of the season against the Buffalo Bulls it’s been pretty obvious who has been rumblin for the Buckeyes. There’s been a lot of attention paid to some of the rookies, as well as returning stars like Jordan Hall. Braxton Miller has been met with great anticipation this week for a very good reason. It should be obvious to everybody that he is a much different player now. Elected one of the eight captains this week says all that we need to hear about how much more of a leader he is now. It’s important for the QB to be a leader because sometimes his play may be off a bit and the rest of the team steps up under his direction.